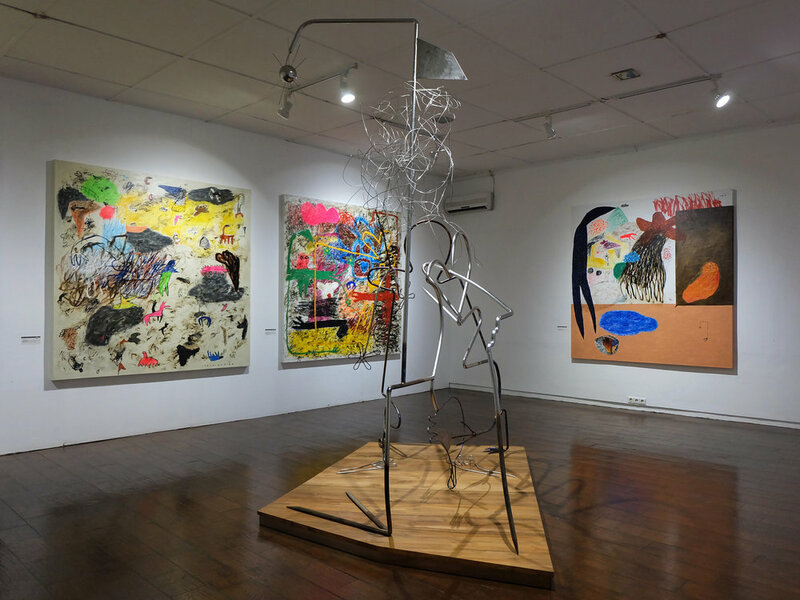 Globetrotter's Dea Karina met up with Indonesian artist and curator Bambang "Toko" Witjaksono at this year's ARTJOG10, the international arts festival held in Yogyakarta, Indonesia each year. In its tenth year, the festival holds fast to its grassroots beginnings, providing a meeting place for national and international artists - not galleries - while supporting both emerging and established creatives. A renowned artist who emerged on the scene in the nineties, Bambang's work is primarily in large scale graphics, with a heavy Pop Art and comic influence. His voice lies at the intersection of words and graphic imagery, the combination resulting in subtle, socially pointed messaging. We caught Bambang at the Jogja National Museum, ARTJOG's home this year. Globetrotter: ARTJOG10's theme this year is, “Changing Perspective." You and the curatorial team said you chose that theme with an aim to challenge an increasingly "profane” paradigm. What does profane mean in this context? Bambang "Toko" Witjaksono: It means being rigid. We want to show that there are various perspectives, and even “Changing Perspective” itself has a vast meaning. From maintaining an object from a certain angle that shifts to another angle to the point that it transforms, that’s already changing perspective. It is also an ideological and philosophical issue, so I present the theme so that the audience will understand the meaning behind it. As a curator, I offered the theme to the artists by giving examples from Marvel’s movie, Dr. Strange. There is the main perspective that views Dr. Strange as a surgeon, but when he had an accident, he could not heal himself. Then he went to Nepal and he gained a new perspective and became a superhero. See, he was a surgeon - that’s a profession from a very logical field - but because it turns out that he cannot heal himself, he went on a journey to find the cure and discover the hidden world of spirits, mystics, and magic. In my opinion, when I compare it with the conditions of today, there are lots of people who only have one perspective, and they have become intolerant. In the flesh: Bambang "Toko" Witjaksono, the curator for ARTJOG10, speaks with Globetrotter. GT: How are Wedhar Riyadi's Floating Eyes display [a main commissioned work at ARTJOG10] informed by the curatorial theme “Changing Perspective”? BTW: We want to focus on the subject; how people see. Eyes represent how you see, so it symbolizes perspective. When the public walks through the artwork, it would seem that those installations are looking at them, and they themselves are also looking at the artwork. When we take a selfie and upload it, our friends can also see it through screens, so there is a vast amount of perspectives. GT: And even now, they voluntarily show only parts of themselves, right? BTW: Yes, yes. Now the problem is, how can we be open to multiple perspectives and not be limited only to one? What we think is right can be wrong the next morning. GT: What are your considerations in curation? Are there any specific elements of the artwork that you look for in the selection? BTW: First is its relevance with the theme. So [artists] send us the concepts, and from there we try to see its relevance with its artwork and the curatorial theme. It cannot belong with other topics, for example, if an artwork seems to express something about youth or happiness but also changing perspectives, and it fits if the theme of either “youth” or “happiness” as well, it is not selected. It has to exclusively belong in the curatorial theme of “Changing Perspectives." Venzha Christ's "The Unknown," 2017. GT: Can you elaborate on Venzha Christ's "The Unknown" [above]? To me, it just looks like a green alien in a jar. BTW: It focuses more on the type of art. Because when people think of art, they usually think art is limited to fine art such as statues, sculptures, etc. Venzha Christ (the artist) wants to change the perspective and show that science can also be art. When the audience sees this, they might be confused as to why this is in ARTJOG, therefore they would be driven to analyze the artwork and its meaning. Tompi's "Panic," "Soulless", and "Spirit" (from left to right). GT: How do the photographs from artist Tompi [a famous jazz singer and MC from Aceh] correlate with the theme? BTW: Because the theme is broad, it also covers the artist themselves. People see Tompi mostly as a singer but not as an artist. When they see that this is Tompi’s, their perspective of him might change from just a singer to also a photographer. GT: In the press release, you mentioned conditions that can trigger mindset disorder. What does that mean? Is it when we realize our perspective is being challenged by another? BTW: It means that what is considered the truth from when you grow up is taken for granted. Such as “you cannot do this," otherwise you will commit a sin. If it is a sin, then it is not questioned anymore, even though by nature, children are free from values because they were not ingrained in them yet. For example, they were told to pray. What are they praying for? If you have a God, who is He? Who does God worship? Children are free of them, but when they finally are taught by dogmas, those questions disappear. If they open their perspectives - this is not an effort to discredit God - they will open new possibilities and they will understand. This is also relevant with current cases of religious intolerance. GT: I see, I see. What are your expectations for people who've experienced ARTJOG? A changed perspective or an open mind, as a start? BTW: An open mind first. Afterwards, it’s a choice; to stay or to change. If you have an open mind, there’s a vast amount of perspectives open to you, not just what is pragmatic or logical. When we all understand that there are lots of perspectives, then we can be more tolerant. BTW: Yes that’s why when I envision the theme, I was considering sociopolitical conditions, especially in Indonesia. GT: In your opinion, does Jogja [Yogyakarta] have a “Changing Perspective” emergency? BTW: Yes. People from Jogja are known for their kindness, but we are actually the second most intolerant city in Indonesia. I read it somewhere. There were some shooting cases and some incidents involving FPI [Front Pembela Islam, a fundamentalist religious organization] and such, even though we consider ourselves “Bhinneka Tunggal Ika” [Unity in Diversity, the motto of Indonesia]. GT: Meanwhile, Jogja is famous for being a city of artists. BTW: Yes, we are starting to be that way. As a whole, places nowadays are paradoxes. For example, Jogja is known for its kind, soft, and polite people. However, if we see its history, there were lots of power struggles and fights to win the crown. Remember that Jogja is a kingdom. That is Jogja’s paradox. GT: So paradoxes exist in all aspects here? BTW: Yes, people only know about the slogan and image but those are all they are; images. If we look at way back to its background, there are lots of paradoxes. If one already realizes that an image is only skin-deep, one can realize the many paradoxes inside; the odd and the twisted truths. That is where we need an open mind. All photos c/o Dea Karina.